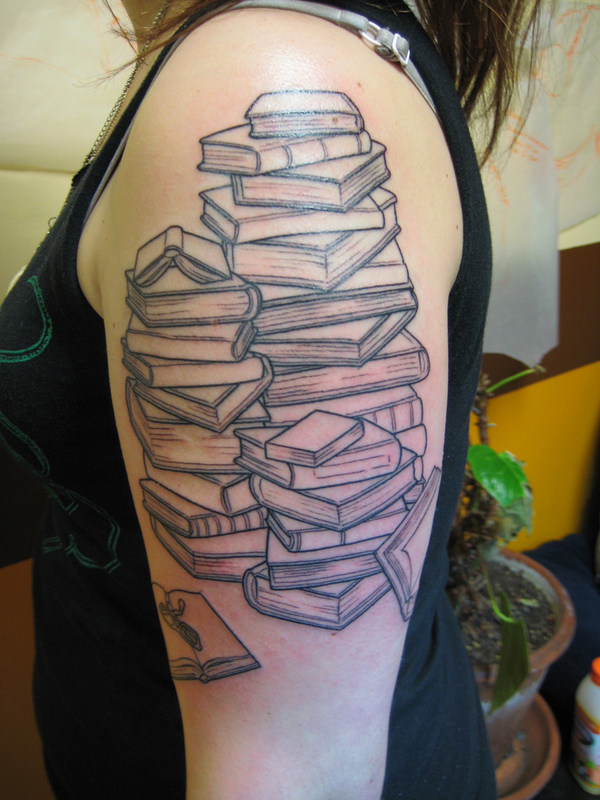 Stack of Books tattoo-photo by S. Archuleta, flickr. I love books, maybe not as much as the young woman shown here, but I could definitely see myself with a minute bookshelf of my favorites, tattooed above my shoulder blade. That’s how much I esteem books. So it pisses me off whenever I hear about another book being banned-and I’m not talking about banned books in Iraq or North Korea, I’m talking about banned books here, in the U.S.A.
Steinbeck’s “The Grapes of Wrath,” was also temporarily banned in California in 1939, for its allegedly unflattering portrayal of the Monterey/Salinas area.The Supreme Court overturned the prohibitions on these and other books since then. While not ‘technically banning’ books, Arizona chose to eliminate Mexican American Studies in the Tuscon Unified School District in 2010. The TUSD board voted (4-1) to end the Mexican-American Studies (MAS) curriculum, thus ending the use of certain books. Their view is that they have ‘removed’ books, not ‘banned.’ It’s an ongoing debate based on perspective. Arizona Superintendent of Public Instruction, J. Huppenthal, declared the MAS program illegal last year under a new state law banning “racially-divisive classes.” He determined that Tucson’s Mexican-American studies program violated a state law, a law that he helped write, that bans courses that “encourage resentment toward a race or class of people,” and are designed primarily for one ethnic group. I’ve read four of the seven books. My mother has read all of them, but then again, she did have a double major in college: Sociology and Chicano Studies. Both of us have had careers in law enforcement and social service agencies. Neither of us resent a race or class of people. What troubles me is the prohibition of another writer’s viewpoints and removing the ability for young people to be able to read a text (that is approved in all MAS and Ethnic Studies curriculum), debate its contents, and then make up their own mind. Vote to Restore the American Dream in Arizona. A Great Nation Does not Fear Kids Reading Books. Families in a 38-year-old segregation lawsuit against Tucson Unified School District are asking a federal judge to reinstate the school district’s recently suspended Mexican-American studies classes, arguing that they are critical to ending discrimination for students. A U.S. District Court judge has overseen the settlement between the school district and the families, which included the creation of an African-American studies program and then Mexican-American studies in 1997. In support of the right to choose books freely for ourselves, the American Library Association co-sponsors Banned Books Week (its inception was 1982), an annual celebration of our right to access books without censorship. The ALA and several other associations such as American Booksellers sponsor the event. For 2012 the week is September 30-October 6. “It is the one time during the year that booksellers and librarians can talk to their customers about the hundreds of book challenges that occur in schools and libraries around the country every year. American Booksellers Foundation for Free Expression will help booksellers make videos of people reading from banned books and post them online. Last year, ABFFE promoted the Internet read-out to booksellers, who produced more than 90 videos. Altogether they and others posted more than 800 videos of people reading from banned books on YouTube, which, ABFFE said, “helped attract unprecedented press attention to Banned Books Week.” Details are available at abffe.org. So, in praise of books and a big Bronx Cheer to the threat to our 1st Amendment rights and the ability to make a choice in what books we can read, I offer this chingon poem from a Chingona Poet, that I read on La Bloga. they went hiding behind trees. looking for the place of books. and stuffed in plastic bags. Any book lovers out there have something they want to share? Previous postThe Earthquake in Aurora, USA. Freedom to read. Something we must stand strong for. Thank you for reading and your kind words, John. It’s an honor to have this post reblogged to your readers. I too love books and don’t agree with banning or burning books but this issue is about white supremacy, really, isn’t it? I don’t know if I agree, Writersdream9, with saying it’s about white supremacy. I would agree that it is a reflection of a state of mind which believes ‘they’ know better what I can, or you can, or our children can read. It takes away choice. You may be right!. Sometimes I read things into things. Basically, I guess i’d jst say “power over, instead of power with” Thanks again, dear heart!